The royal family is giving the world its first official look at little Prince George Louis Alexander. On Monday, Kensington Palace released two photos of the Duke and Duchess of Cambridge with the future king swaddled in a blanket. But they weren’t photographed in the conventional style, putting a modern spin on what it means to be a royal. 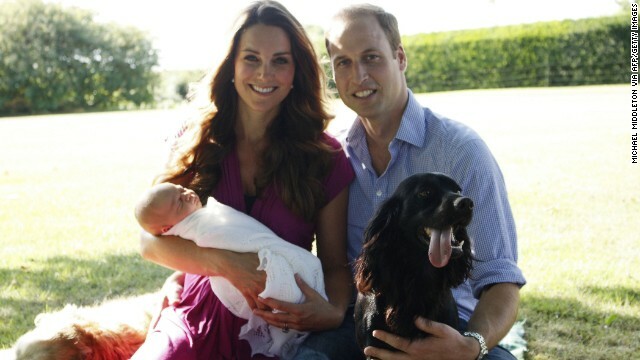 “Contrary to formal royal baby portraits of the past taken by professional photographers, these family photos were snapped by the baby's grandfather, Michael Middleton, in the backyard garden of the Middleton family home in Bucklebury,” reports CNN's Max Foster. While his skills behind the lens are being criticized by the British press, who claim the photos are "very flat and there is not a great deal of contrast in them" and "the parents are also out of focus in both pictures,” the subjects in his photos look perfectly content. "He's growing quite quickly actually, but he's a little fighter,” Prince William says. “He wiggles around quite a lot and he doesn't want to go to sleep that much." The family’s four-legged members enter the frame in one photo. Tilly is the Middleton family retriever, and Lupo is the couple's Cocker Spaniel, "who now has to share the attention of the doting parents,” Foster explains. “He's been slobbering sort of around the house a bit, so he's perfectly happy,” the new father says of Lupo.